All I hear is “Closed”. Mark planned this trip. He made and printed out the directions and everything. There was a three-day weekend and I told Mark I wanted to, “do something” so he put this all together. Our first stop was to see a thousand and eight Buddha statues. Mark wasn’t too sure he could find this place because there wasn’t much information about it online. He knew the town it was in, but that was about it. We walked into a grocery store. I found a lady walking around and stopped her. She responded by saying something like, “not even a little bit” in Japanese. But, I didn’t let a little thing like her not knowing any English at all stop me. Then she did something that almost all Japanese people do when they have to answer a hard question. She tilted her head to one side and sucked in air through her mouth. Mark took out the map and handed it to her. As she looked through it another lady passed by. I don’t speak Japanese but I imagined the conversation went something like this. Lady 3 – “Hey what’s going on? Why are there so many foreigners in this store? 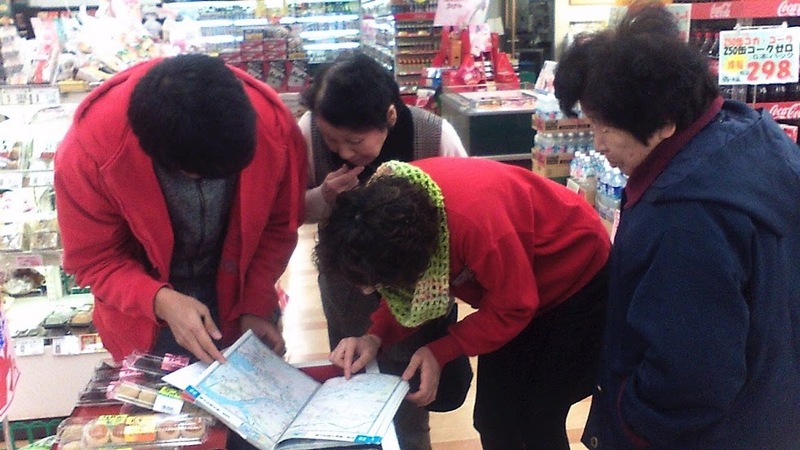 Eventually, with the help of a small crowd of old ladies, we were able to find the temple on our map written in Kanji. So remember, dear reader, when lost in Japan, go to a grocery store to ask for directions. The smart one is the one in the middle. Of course we would have still missed the turn to the 1008 Buddhas had it not been for the giant lady in the picture at the start of this post. The roads on the map are a little ambiguous. We thought the turn was further down the road and we weren’t even looking out for signs yet. We saw a huge statue sticking out on the horizon. 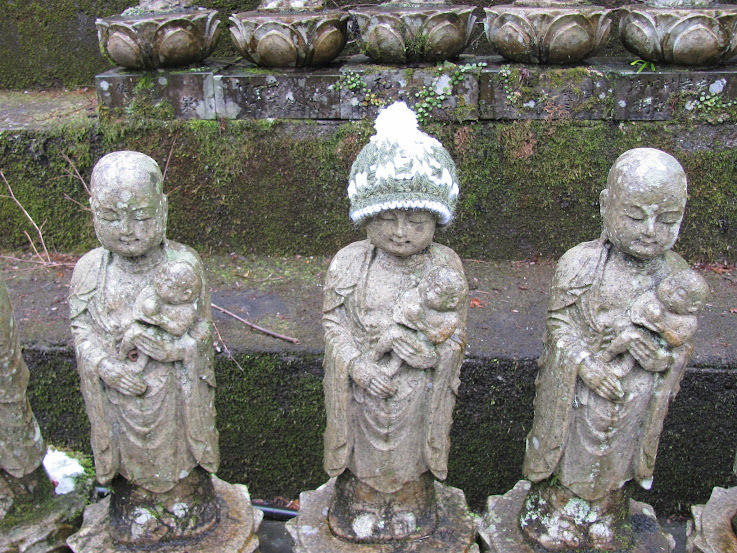 We were wondering if we should go look at it before or after seeing the Buddhas. Mark concluded that since the 1008 Buddhas might be hard to find, we should check out the lady first. 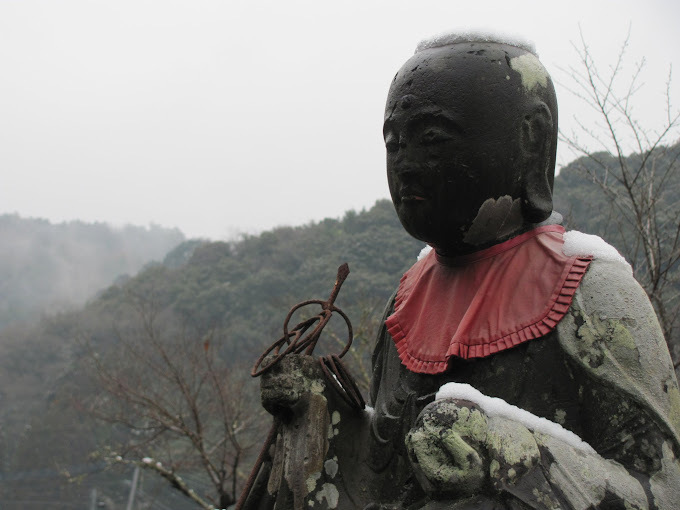 Then we might find someone who could give us better directions to the Buddhas. There was no one there to ask for directions, but in our search for the path up to the big lady, we found the temple with the many Buddhas. Hazzah! 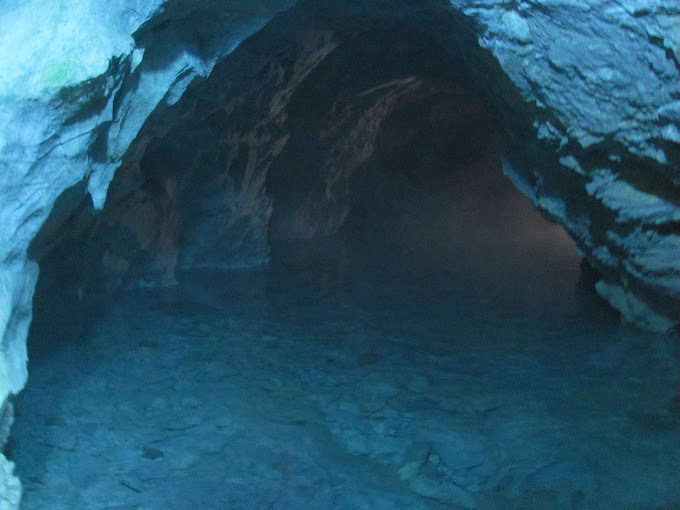 Our next stop was the Underwater Cave. It was not hard to find at all. The drive was a bit scary due to the windiness of the supposedly, 2-lane back roads with drops off sheer cliffs. Some drivers seem to take these roads as a challenge and refuse to drive at a sane speed. I try to pull over whenever I can to let these types of drivers by. I think they should die alone and definitely without me. 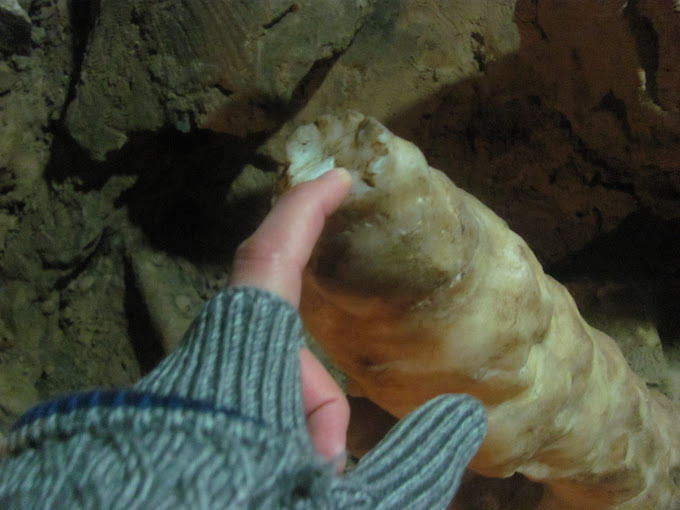 The cave was okay; nothing like Hwanseon Cave in Samcheok, but still worth seeing. 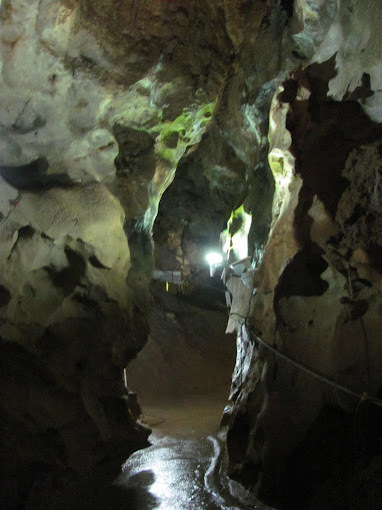 There were many kitschy things to pose with and take photos of outside the cave. It might even be a nice place to go camping or “cabin-ing” in the summer. Every country has its Niagara. I travel a lot… a whole lot. Everywhere I go the locals of whatever country I’m in will say, “Go to such-and-such Falls. 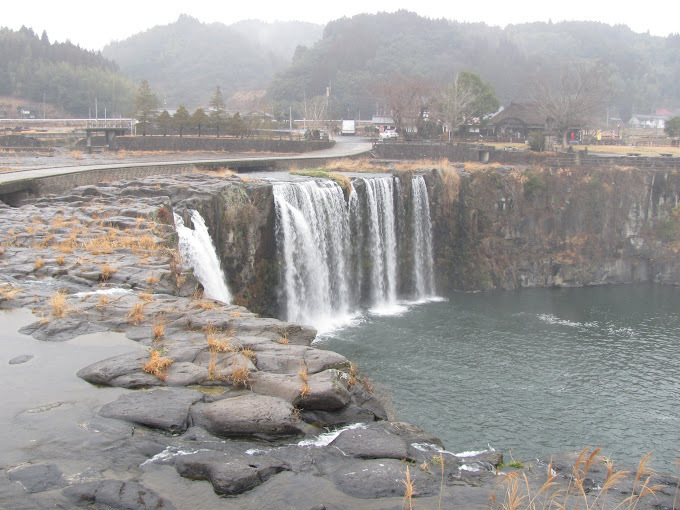 It’s the Niagara of this country.” Then I would make my way there, usually by hiking up or climbing some horribly steep mountain to see the falls, only to be disappointed. Below is the Niagara of the US and Canada; otherwise known as just Niagara Falls. Notice how small the 100-passenger boat looks in comparison. The falls in the picture above does not have enough water to float a dinghy, much less a 100-passenger vessel. 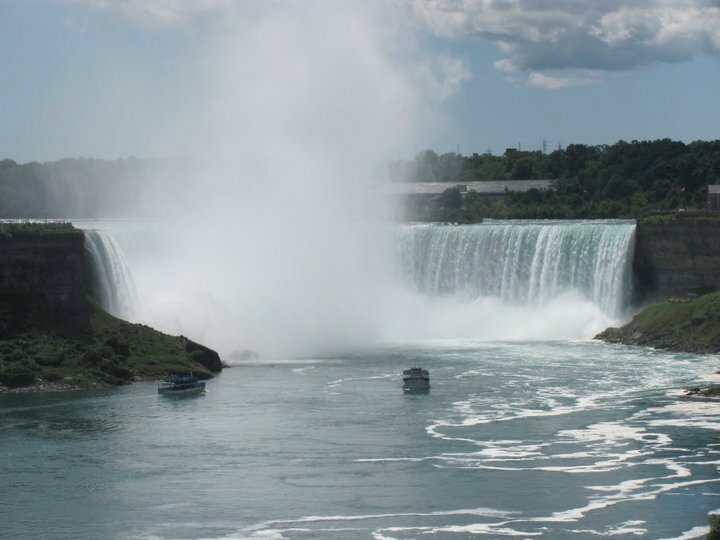 …And the picture below is of only part of Niagara. There is more to the left out of the shot. 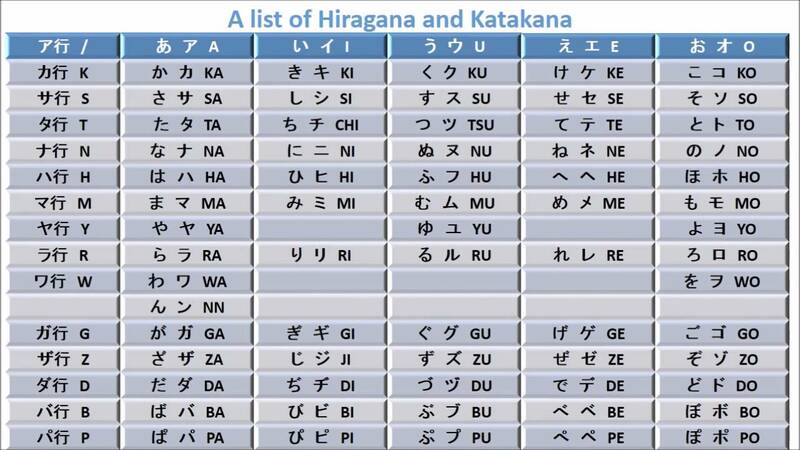 So, lets all agree that Harajiri Falls is no Niagara. That said, it was still very nice. If I lived in Ogata I would come here for a picnic at least once a month. There was a terrifying, but, hopefully safe, rope bridge to walk across. Nearby there was a lovely restaurant. The falls came with more that ample free parking, which I love. And I think it’s worth a trip here just to get some nice photos. We left the county… I mean prefecture. 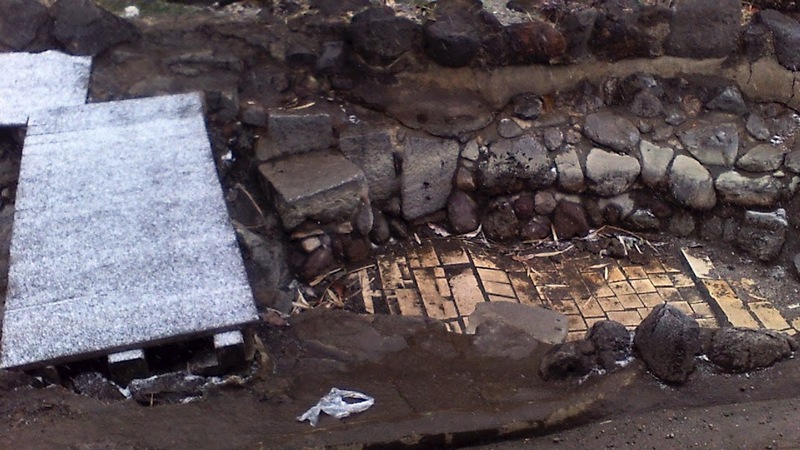 We were going to see a volcano, a mound, and then maybe a bridge that spouts water. Now I must digress from my tale a bit to tell you about something we happened upon. Three times on this trip we heard some weird sounding music. The first time it happen, we just thought that someone in the car ahead or behind us was play their music at full blast on very bad speakers. The second time it happen we knew exactly where the music was coming from. The third time, we recorded it. 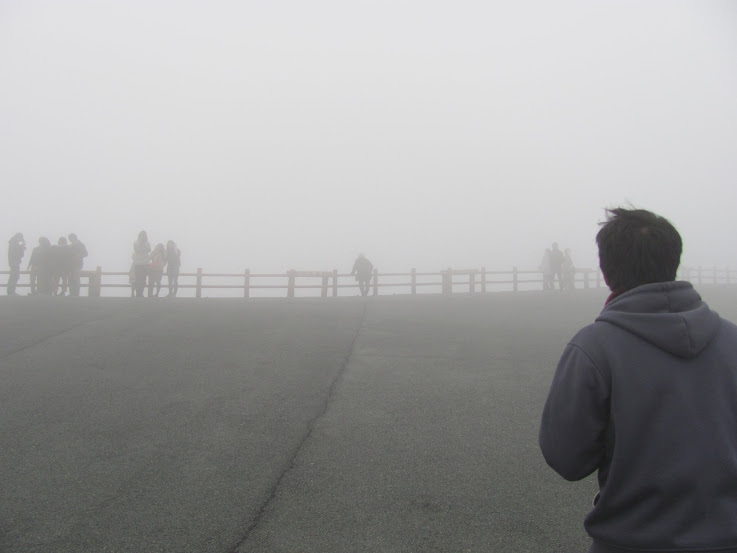 Mark and I went all the way up Aso mountain, or as far as we could drive for free. When we got to the toll road it was closed. We were an hour too late. It was 17:00 in the evening. Even though Oita city is about a 2.5 hour drive from where we were in Aso, I didn’t want to go home. I still had hopes of seeing the volcano the next day and it didn’t make sense to drive home to then drive back. Unplanned overnight trips and sitting by wood burning stoves and now my favorite things. 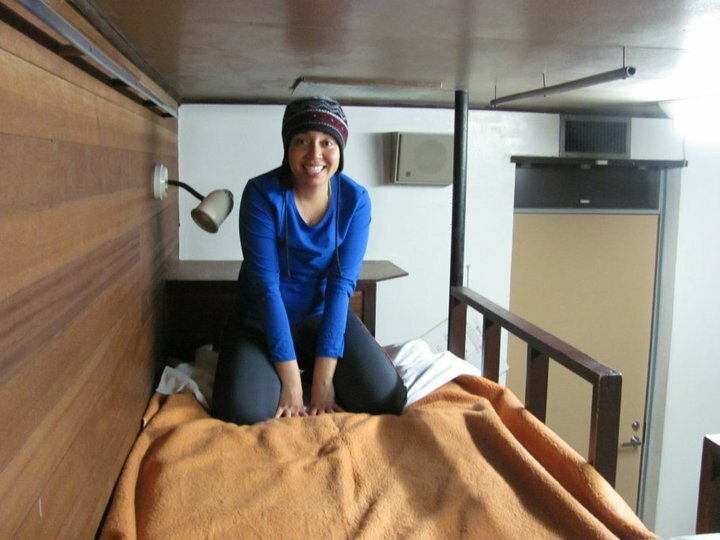 I remembered that we passed a hostel on our way up the mountain. 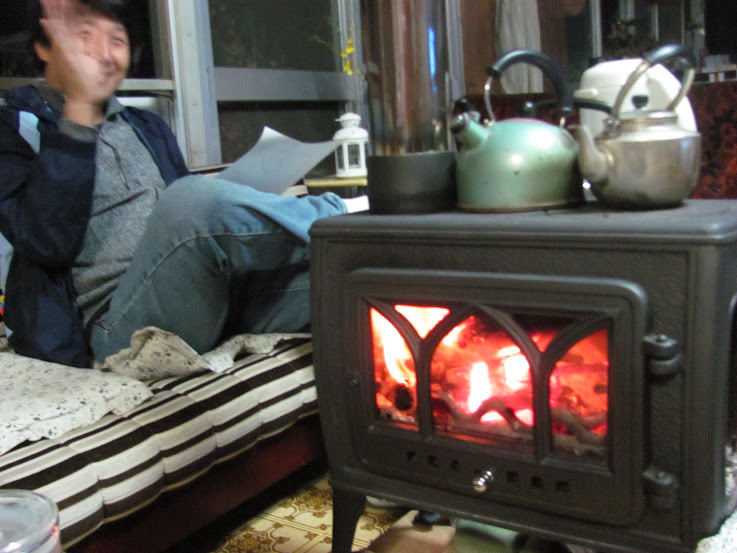 Mark and I decided that if the cheapest room cost 4,000YEN per person per night or less, we would stay. Well, the sign was accurate. It really was 2,000YEN per person per night; no strings attached. 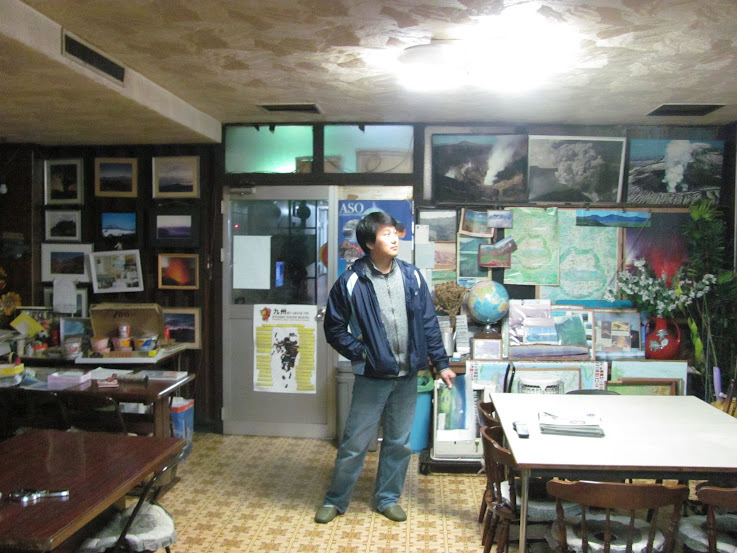 The hostel is run by two sweet old ladies, who speak a little English. That night we were the only guests. They had the bus scheduled hung up in the lounge. We planned to take the bus up the mountain and then the “ropeway” to the crater if there was indeed “many snow” the next day. …which there was. It’s like a snow cloud threw up everywhere! At 9:50 we were standing at the bus stop to wait for the 9:55 bus. We waited in the cold. The wind whipped at our backs. Even though I had on my pajamas under my jeans and yesterday’s dirty socks over today’s clean ones, I felt grossly under-dressed. 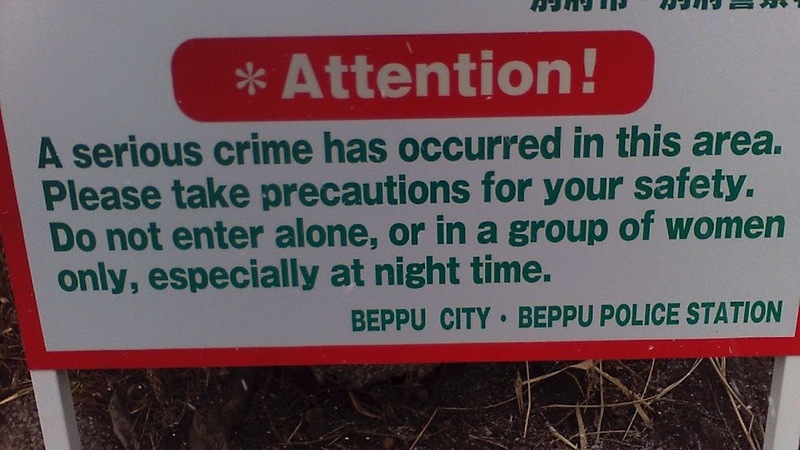 We took a picture of the sign and walked back to the hostel. We showed the picture to one of the ladies. “Put chain on tire,” is what she read. At that moment our bus drove by, without us. The next bus wouldn’t pass by for another hour. Mark and I decided to drive down to the bus station and catch the bus there. That way, we could wait indoors and maybe get a cup of hot coffee. Besides, if it started to snow harder, it would be better to not have to drive down the mountain later. 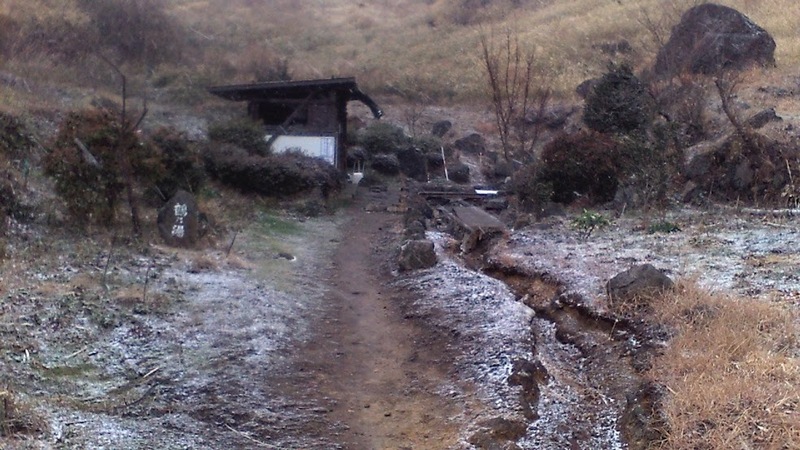 When it’s icy enough, you can just slide down Aso. We walked into the bus station’s ticket office. There was a small line. I over heard a Korean couple asking about the bus to the top of Aso mountain. The Japanese ticket clerk didn’t speak English very well, but he managed to say that the bus was still running, but the cable car and the toll road were closed. A German couple behind us in line asked if we could walk to the crater. Incredulously, I said, “But that’s a 3 kilometer walk; there’s no way it can be done in that snow!” The German lady seemed to like the challenge and responded, “I can do it.” Her husband nodded in agreement. We drove back to Oita with heavy hearts. Back in our neck of the woods, we drove over to Beppu to look for some free outdoor onsens. They are referred to as “wild onsens” which make them sound even more appealing. We knew of 3 and planned to test them all out by doing a little onsen hopping. But the first one had no water. The other two were completely closed off with a locked gate and a sign like the one in the picture above. Last August a woman named, Hiromi Yokote from Kobe while alone near the Nabeyama-no-yu onsen was murdered. The Police are apparently still looking for suspects and/ or witnesses. All the wild onsens that Mark and I know about in Beppu are closed. I’m not sure if it is because of the murder or the season. Our plan B was to go to any of the many private onsens in the area, but they were all full or separated by gender. 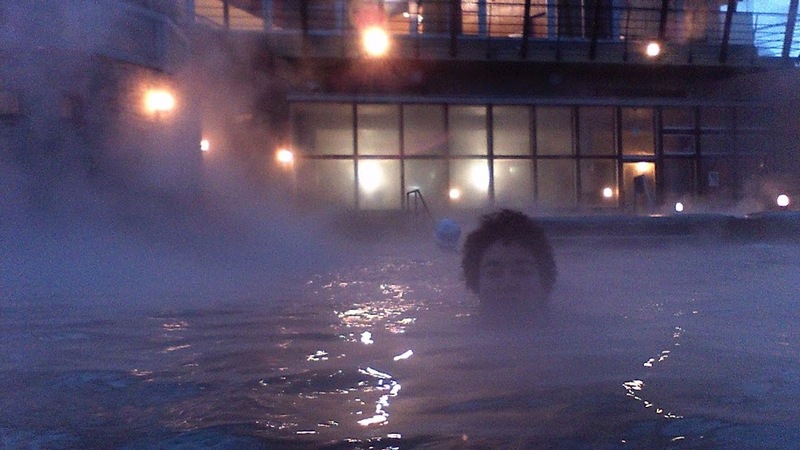 So we ended up going to an onsen that we had both been to before. All in all, it was a very good weekend! 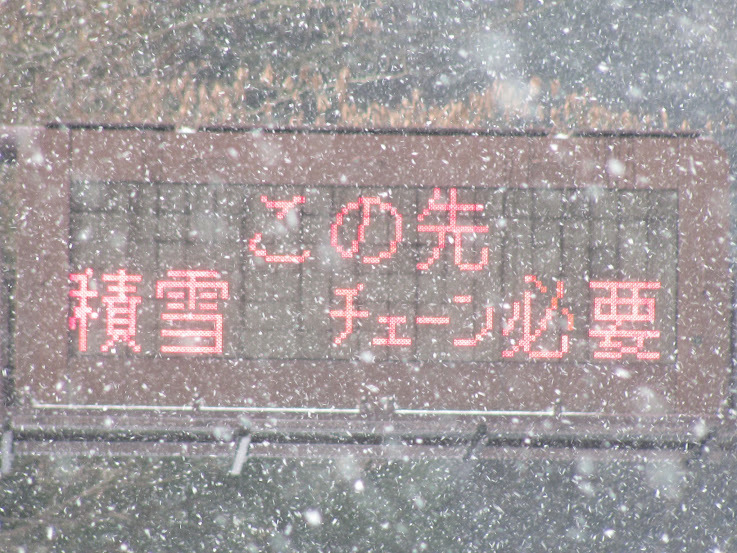 Be careful, in or near Inukai do not get on the Inukai By-Pass. Instead go onto route 326. Route 326 will then merge with route 502 heading west. When routes 326 and route 502 splits, stay with route 326. When you see this sign, follow it to Uchiyama Kannon. (If you pass the gas station you’ve missed it. But you can turn at the gas station. See the google map below. You will find 2 temples. One is right by the parking lot. The other is a 1 minute walk away. 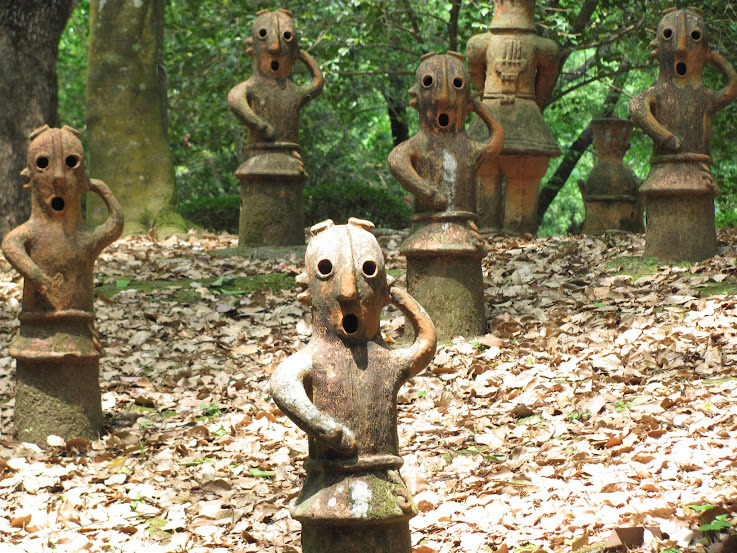 The giant statues is a little walk up a trail by the second temple. Lots of free parking and a decent public bath, but you will have to bring your own soap. When routes 326 and route 502 splits, stay with route 502. After you pass Bungo-Kiyokawa Station look out for route 45. Take route 45 heading south. You will see a sign for the cave on your right, eventually. This place will soon have a cabins and a camp site. When you get to the town of Ogata look out for route 7. Turn left on route 7. 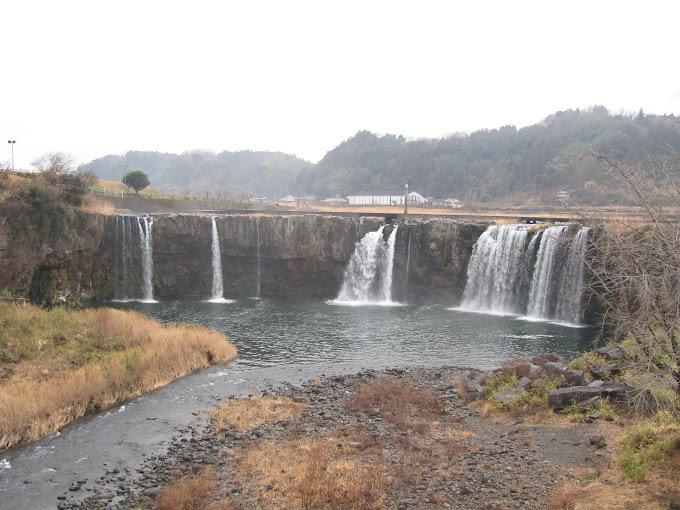 The falls are about 200 meters down route 7. Always available, though the restaurant and shops nearby do close. Once you’ve left Oita Prefecture and you’ve passed the windy mountain area look out for route 111. Take a left onto route 111. The hostel will be on your left before the information center. This place is run by 2 little old lady who speak a little English. They are both very nice. It does not have a restaurant, but there is a Joyfull (not Joyful,butJoyfull) not too far away on route 57. Turn right from route 111 onto route 57. It’s next to a Family Mart. Mostly you will get lost. Take route 10 heading north. When you see “Las Vagas” turn left on route 500. 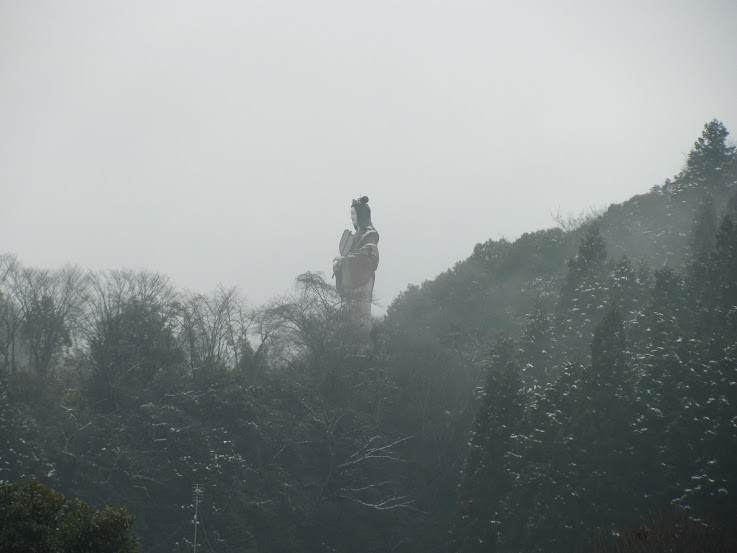 Pass the Hells of Beppu and stay on route 500. Be careful, because route 500 turns. If you find yourself in route 11, you weren’t paying attention. Before you pass under the expressway, you will see a shrap turn on your left. You will look at it and think, there is no way in hell my car, or any car for that matter, can make it up that hill. Follow it until you have to make a turn. Turn right there and go under the expressway. Drive as far as you can pass the hundreds of graves. When you almost get to a round-about you will see a flat area on the left where you can park. Park your car and walk up the hill. 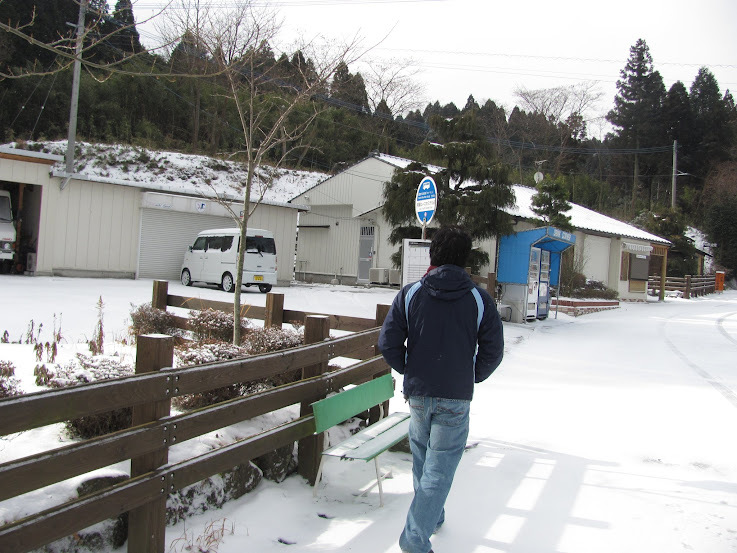 Then follow the path to the onsen. After you pass under the expressway, route 500 will take a sharp turn right. You will leave route 500 and go straight. Keep going straight even though you will begin to think that you can’t possibly still be on a drivable road. Honk your horn around corners if it makes you feel safer. Who knows, it might help. This road leads you straight to the gate. Then you’re on your own. When I went there all 3 of these were closed or had no water in them. It might be because of the season, the murder, or a combination of the two. *Update: The police have apprehended a suspect in the murder of Hiromi Yokote. Drive to Beppu at way of route 10 which is also route 52 through downtown Beppu. 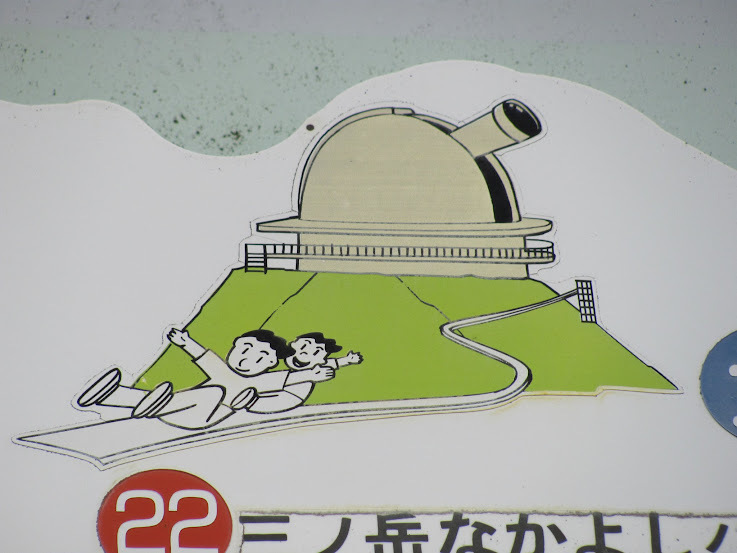 It’s along route 10/52 and across the street from a pachinko parlor; what isn’t in Japan? 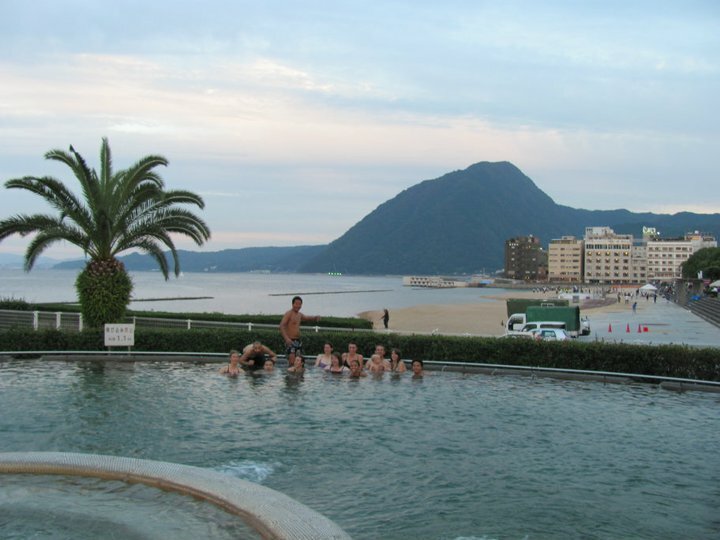 The nearby landmarks near would be Beppu Central Hostipal and a short swimmable section of beach. Exit through the east end of the station. Head east until you reach route 10. Then go north on route 10 until you pass Beppu Central Hospital. Cross the street and look out for the osen. You can bring your own towel, razor, or what have you, or you can rent them. Shampoo, conditioner, and soap are free. This is a co-ed onsen, so you must wear a swimsuit when you go outdoors. You can go naked in the gender segregated areas. Every now and then they change the gender of the locker rooms. So don’t head off to change in one direction that was the lady’s area the last time you came. You will need to have a 100 yen coin to put your shoes in a small locker in the main lobby. Everyone must have their own locker and you will get your coin back when you retrieve your shoes. Give your shoe locker key to the front desk clerk and he or she will give you a corresponding key to the lockers in the gender segregated area. Put your stuff in that locker. Take a shower. Put on your swim suit and head outdoors. There is also a sauna and a bucket of freezing cold water that you can torture yourself with.